Speeding is one of the most common types of traffic tickets issued in the State of New Jersey, as well as in most other states in the country. For most drivers, especially those driving on the open roads or highways when it is not congested, going over the speed limit is easy to do. But what isn’t easy is paying the fines and consequences of a speeding ticket. If you or someone you know has gotten a speeding ticket, it does not mean that you have to automatically plead guilty and pay the penalties. At the Law Offices of Dan T. Matrafajlo, our New Jersey Speeding Tickets can help you fight your speeding ticket. What Is the Different Speed Limits in New Jersey? – 25 miles per hour in a school zone when children are visible from the roadway. – 25 miles per hour in a business or residential district. – 35 miles per hour in a suburban business or residential district. – 50 miles per hour in all other locations. The Commissioner of Transportation can decide that any of these speeds are greater or less than is reasonable or safe for any specific stretch of a highway, and may adjust the speed limit accordingly. In such a case, an appropriate sign will be erected, which drivers must follow. A driver must also reduce his speed as appropriate at a train crossing, when going around a curve, at the crest of a hill, on a narrow or winding road, or when pedestrians, traffic, weather, or highway conditions warrant it. Exceeding the speed limit by 40 miles per hour or more (or by 20 miles per hour or more in a construction zone or safe corridor) requires a court appearance. In addition to the fines listed above, the New Jersey Motor Vehicle violation Commission will add points to your driving record. If you accumulate enough of these points, you will be subject to additional fines, or even a license suspension (if you have 12 or more points at any time). New Jersey-licensed auto insurance providers have a separate system of “insurance eligibility points,” which they use to determine the premiums you have to pay. Being convicted of or pleading guilty to a speeding ticket will result in more points and higher premiums for three years. If you have received a speeding ticket in New Jersey, you may face serious penalties, including monetary fines, higher insurance rates, or loss of your license. An experienced NJ speeding ticket attorney can help protect you and your driving record. 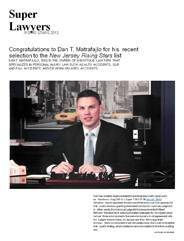 Attorney Dan Matrafajlo has been representing central New Jersey drivers for years. Please call (908) 248-4404 today to schedule a free consultation.